Bella Lana’s Scott Brien holds $5000 sale-topper with Brad Wilson, Landmark, Dubbo; buyers Muz and Bec O’Malveney, “Yeramba”, Canowindra, with Bella Lana’s Anna Brien. 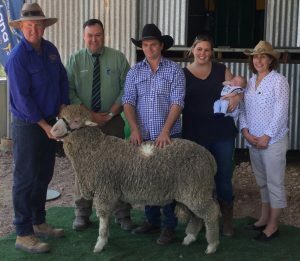 Muz O’Malveney returned to buy the top-priced ram for the second year at the Brien family’s Bella Lana Merino ram sale last Friday. HISTORY repeated at the 9th annual Bella Lana Merino on-property ram sale last Friday at Wellington when the buyer of the top-priced ram last year returned and bought again. Muz and Bec O’Malveney, “Yeramba”, Canowindra, paid $5000 top price for a 19.6 micron son of Bella Lana 130296 showing Australian Sheep Breeding Value traits and indexes of 6.9 for yearling weight and a standard deviation (SD) of 3 micron and 15.3 per cent coefficient of variation (CV) with a 99.5pc comfort factor (CF). Also paying $2800 for another ram of 20 micron sired by Leahcim 111173, Mr O’Malveney paid $8000 for the top-priced ram last year. Joining 800 ewes of 18.5 micron and shearing twice a year for an accumulative 7kg, Mr O’Malveney said he aimed for 8kg fleeces over two shearings and Bella Lana rams would “do the job”. Warren Leeson, “Anglewood”, Dunedoo, returned to purchase three rams topping at $4800 and averaging $3667 while Ian and Linda Dobel, “Valley Grove”, Rockley, also bought three rams paying to $4600 and averaging $3200. Littleton Partnership, Thallon, Qld, bought a trio for an average $2133 and top of $2800 while the Edwards family secured three averaging $1933 and topping at $2400. Wargandinna Partnership, Burren Junction, bought five to $2600 twice to average $1920. The sale was conducted by Landmark Dubbo with Baden Chaffey, Scone, handled auctioneer duties.